“Look here! Cheese!” Chao says to everyone at my roommate Calsi’s 22-year-old birthday party, as he is about to take a photo of all of us together. He is the busiest person in the room, squeezing through the crowd and trying to capture each joyful smile. Chao with photography gear in tow. In my last year at the University of Wisconsin-Madison, I shared a room with Calsi in a four-bedroom apartment. Chao is the boyfriend of another of my roommates. As a skillful photographer with a degree in fine arts, he keeps busy taking photos and recording parties. Chao’s photography is different and impressive. He seems to capture the perfect framing, lighting and position. He seldom asks a subject to stand still or strike a pose. Instead, he observes, waits and shoots. 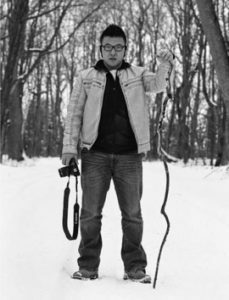 Chao was born to be a photographer, but behind his passion is a three-year-long battle with his family. Chao immigrated to the United States from China with his family in 2004. Traveling halfway around the world, his family settled in Green Bay, Wisconsin. Looking back on his parents’ decision to move to America, Chao says they wanted to gain fortune, but more importantly, stability. Chao’s parents used to work in a state-owned company in China. Such a job is sometimes referred to as an “iron rice bowl” in Chinese, meaning a guaranteed lifetime employment. However, it did not turn out that way. China did not have any private-owned businesses before the economic reforms in 1978, when China adopted principles of market economics and allowed entrepreneurs to start their own businesses. During the 1990s, a wide-scale privatization process was launched in the state-owned sector. China’s economic system, which was previously controlled by the state, shifted to incentives for private entities. Since then, many state-owned businesses shut down, and so did the company Chao’s parents worked for. His parents gained some compensation for losing their jobs because their labor contracts with the company had not expired yet. Yet the money was far less than enough to guarantee a stable and comfortable life for the family. With financial support from family and friends, Chao’s family saved enough money and flew across the Pacific Ocean to look for a better life. Stability now matters for Chao’s parents when making decisions. To them, Chao should also look for a career that guarantees a steady income. Chao’s talents in painting and drawing led his high school instructor to recommend that he apply to art school. His parents insisted however that he study business in college. As his parents wished, Chao majored in international business at UW-Madison. After two years, he was fed up with studying business. He could not imagine himself wearing a suit and tie, following a nine-to-five routine and dealing with figures every day. Chao took a gap year to ponder what to do. That was when the battle with his parents escalated. Chao decided to shift his path toward studying fine arts, but his parents strongly disagreed. Countless fights over the phone followed. Chao knew it wouldn’t be easy to change his parents’ minds. Thanks to financial aid, Chao didn’t have to worry about his tuition bill. He could study what he loved without his parents’ financial support. He told his parents that he would pursue fine arts even if they disapproved. After the gap year, he changed his major to fine arts and started his undergraduate study all over again, since business and fine arts had virtually no overlapping courses. Chao was so determined that his parents gradually accepted the reality that nothing could stop their son from chasing his passion for art. Chao moved to San Diego in August and opened his own photography studio. He doesn’t have a steady stream of customers yet, but he is working hard to attract clients. As he works at it, he has the support from his family to do what he is passionate about.